Designed and constructed by the eminent New York City architectural firm of Warren & Wetmore, Eagle's Nest estate is the easternmost Gold Coast mansion on Long Island's affluent North Shore. From 1910 to 1944, the palatial Spanish Revival estate was the summer home of William K. Vanderbilt II, great-grandson of Commodore Cornelius Vanderbilt. Eagle's Nest hosted the most exclusive guests and intimate gatherings of Vanderbilt family members and close friends. Included among them were the Duke and Duchess of Windsor, golfer Sam Snead, and the Tiffanys. Vanderbilt embarked on many of his legendary world voyages from this locale, along with a 50-person crew and a few fortunate invited passengers. During his travels, he collected natural history specimens and ethnographic artifacts from every corner of the earth. With the help of scientists and museum professionals, Vanderbilt created exhibits at Eagle's Nest to showcase his collections. "Willie K.," as he was known, bequeathed his estate and museum to the public, fulfilling his intended mission. Stephanie Gress is the director of curatorial affairs for the Suffolk County Vanderbilt Museum and has been employed there since 2001. 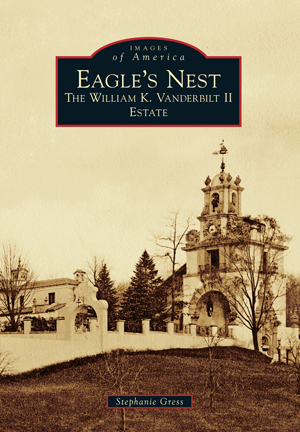 The extensive archival collection from William K. Vanderbilt's life and times provided Gress with over 180 original images documenting the history of Eagle's Nest.